We learn so much from our Tripawd Kitty members! Every new Forums Discussion about three legged cats helps us expand our knowledge so that we can help future felines who join our community. 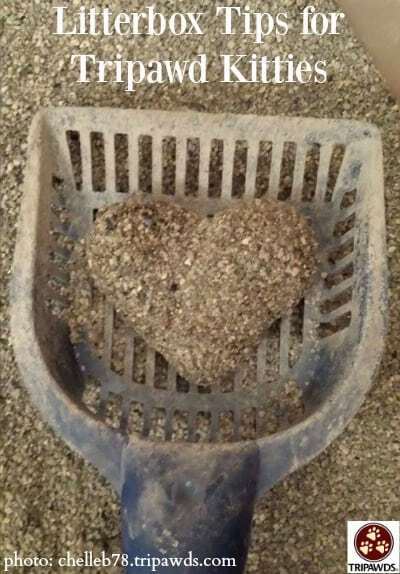 A recent discussion about Tripawd Cat Litterbox Issues was super enlightening! He is doing GREAT, he runs and plays and is thriving. . . The only issue is when he is in the litterbox, he seems to have phantom leg issues and tries to cover up his “business” using his amputated leg. He seems to get frustrated and gets his shoulder closer and closer to the litter trying to move it and cover it up. He sometimes ends up getting litter on his face and his belly, and he seems really frustrated. Then eventually he seems to realizes that leg won’t work, and uses his other front leg. It makes me sad to see him struggle, is there some sort of therapy or training I can do with him to help him? Pellet litter may be slippery. 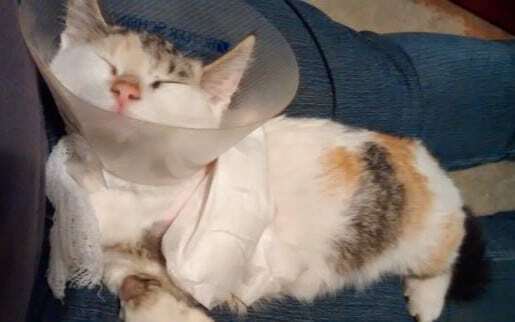 Clay or something like wheat or corn litter may be a better choice (though note: if there are any wounds or incisions still open, litter may stick to them, so something organic and non-clumping is likely to be your best bet). Cats, especially limited-mobility cats, really like to have an entrance and a SEPARATE exit path from the litterbox. To help your tripawd feel extra comfortable, provide them with more than one way to get in/out of the box. Low sides are essential, but are likely to contribute to mess. Use floor protectors, cheap rugs, old towels, heavy-duty rubber litter mats, etc. to help contain the mess and save your floors/sanity.
. She used her litterbox with no problem, but covering her poop did not happen. I did help her with that. She plays with her toys and honestly, the fact that she only has three legs doesn’t get in the way or slow her down. We’ve made a few adjustments for it – namely in pillows and boxes for step downs and a larger litter box. . . . What seemed like a death sentence then was really a chance at life. Do you have Tripawd kitty tips to share? Hop over to the Tripawds Discussion Forums and let us know, we always want to learn from our feline friends! 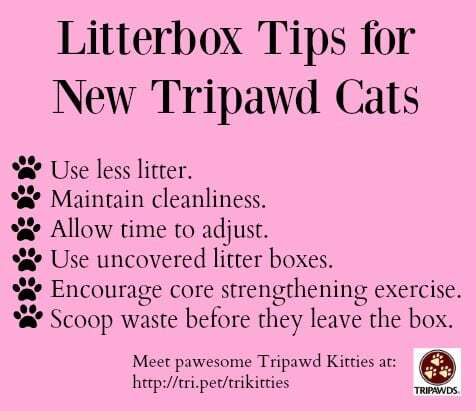 Those are great tips for new kitty tripawds, especially “Be Patient”. I’m sure it’ll be appreciated. Well thank you Kerren and Mona, it’s because of you we’re able to share this kind of information. Thanks for all you do!